Have a question about our Birthday Parties? 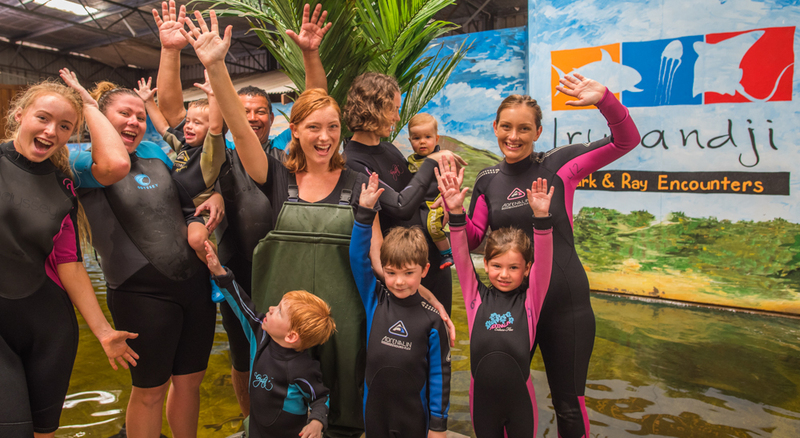 Here are some of the most common questions about Birthday Parties at Irukandji. How many children and adults are able to attend? Our package allows a minimum of 10 paying customers (under 4 is not included in the 10). Party is limited to 50 people, for any extra please contact our staff. Parties over 20 people will be split in half for the tour as we only allow a maximum of 20 people in each pool at a time. Parties over 25 may need an increase in the catering when applicable. Will the Sharks try to eat young kids/babies? No they will not. Babies are not the diet of Sharks they much prefer squid, fish and prawns. Anybody can go in the tanks 0-100yrs! At the scheduled time arranged with your booking. You will be shown to your party balcony where you can await the other guests. What happens with late arrivals? Who should they see? Staff at the entry they will direct them also; to the Party Balcony, the Parties tour will not depart until all the quests have arrived. Swimmers, towels, and a dry change of clothes just in case. Also don’t forget the camera, there are many amazing moments not to be missed. How is the party room decorated? Am I required to bring my own decorations? You are welcome to bring decorations if you like. Please shop sustainably if purchasing disposable goods, think of re-usable, recycled non plastic disposables. Reminder balloons are not permitted inside. Can I bring additional food to the party? You are more then welcome to bring outside food to the party. Again think of the Great Pacific Garbage Patch and shop sustainably e.g. limit disposable plastic. Will there be balloons at the party? Or may I bring some? Balloons are an extreme choking hazard for the fish, as a result we cannot allow them inside the building. They are also a massive cause of wildlife deaths in the ocean, so instead we recommend paper lanterns and streamers. Is there anything else we can’t bring? You are not permitted to bring your own wetsuits due to health reasons for the fish, please don’t use any lotions/repellents before swimming with our fish family and we cannot permit the use of snorkels not that the sharks are so friendly they are in danger when children’s feet start kicking. (The masks are permitted with out the snorkel as long as their feet stay of the ground). Irukandji is open 364 days a year (only closed for Christmas). Hours of operation are 9am – 5pm daily. Can I change the cake design and flavour? Sorry we only have one flavour available.